Ah, 1979. The last nails were being pounded into Disco's coffin, George Lucas was getting set to release the second Star Wars movie, and Monogram released four models from TV's Battlestar Galactica, a series my brother and I found ourselves glued to the TV every Sunday night to see. Heady days indeed for a sci-fi obsessed teen in backwater Michigan, begging his parents for a lift into Imlay City to the D&C, where all the new models and rockets came. Little did we know that the show would only get one season - 17 episodes - and that these would be the last new mass-market sci-fi models from Monogram for 20 years. The Galactica model was typical for sci-fi kits of the time: generally faithfull to the 'originals' in form and outline, but simplified in detail and intended for kids to play with after they built it. Thankfully, this one didn't have the rubber band-powered 'missiles' of the Viper and Raider kits. It did, however, have it's share of flaws. These included missing detail all over, incorrect and super-simplified pylons that hold the launch bays, and decals in the wrong colors. 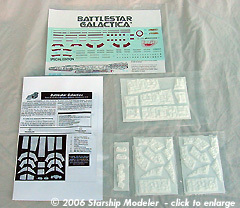 Even with those shortcomings, it's been a much sought-after kit, since all the BSG kits were scarce as hen's teeth after their original release. All four were reissued in 1997, but stayed in the catalog only one year before vanishing again. Fortunately, we now have eBay and various modeling forums and trading sites, so it's easier to find a surviving kit than it was back in my far-off youth. Around the time of the only reissue, a small garage kitter doing business as 'Sublevel 3 Heavy Industries' put out a resin upgrade set for the Galactica model. Years passed, they left the business, and these sets became scarce. SMT picked them up for a while, added decals, but then they too left the business. Finally, TimeSlip Creations came along and obtained permission to resussciate this detail set. Inside the sturdy box are 24 pieces of resin, securely bagged in heat-selaed compartments; one page of instructions and a large ALPS-printed decal sheet. The resin pieces are substantially the same as the orginal SubLevel 3 kit. These are crisply cast in white resin, with almost no bubbles, pits or other flaws. There are four 'wafers' of resin holding the parts, to keep them from rattling around loose in the bags. The pieces are easily trimmed from this carrier, and a fw swipes of 320 grit sandpaper will remove the excess from the back of the parts. 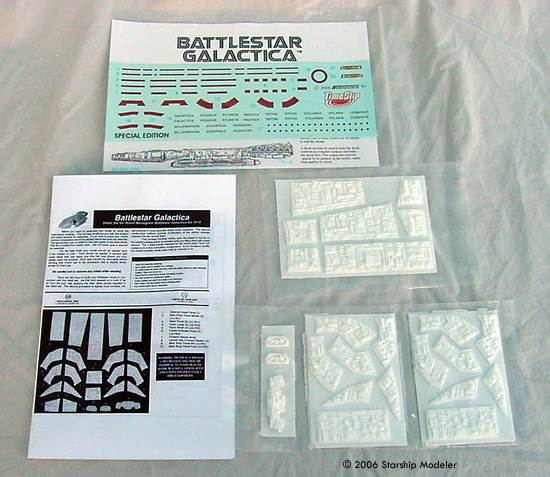 The decal sheet provides all the markings for one battlestar, in the correct colors, and names for 12 ships. It also includes corrected images for the ends of the landing bays. All images are sharply rendered and perfectly registered. As with other ALPS-printed decals, they are very thin. You may want to overcoat them with Microscale Liquid Decal film before using, just to make them easier to handle. The instructions are all new and a vast improvement over previous issues. Done in the style of the 1997 Monogram kit release's instructions, they are clear and detailed. There are several places where you have to cut away parts of the Monogram kit, and the instructions provide pretty dtailed guidance for the operation. 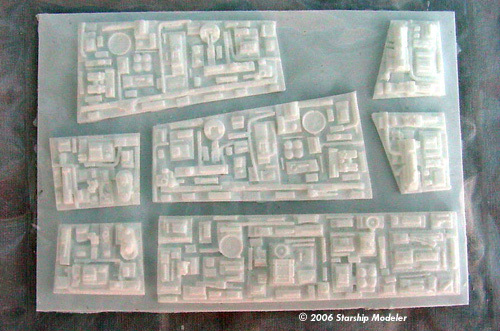 This page copyright © 2006 Starship Modeler. First posted on 16 May 2006.